As a young physicist in the former Soviet Union, Igor Sokolov studied the biggest of the big—the entire universe. Now, as a professor of mechanical engineering at Tufts, he's focused on the tiny, the nano. By zooming in—way, way in—Sokolov and his colleagues study everything from bacteria to beetles down to the nanoscale level. Now he's turned a fresh eye on one of medicine's oldest problems: cancer. Sokolov's instrument of choice is the atomic force microscope (AFM), which uses its minuscule finger-like probe to measure tiny forces at a very small scale, "pretty much between individual atoms," he says. He first came across this technology as a graduate student studying the origins of the universe more than 20 years ago, about the time the AFM was invented. He used it to look for evidence of theoretical elementary particles. When Sokolov didn't find any, his work helped put those ideas to bed. Soon Sokolov turned the instrument toward more earthly concerns. 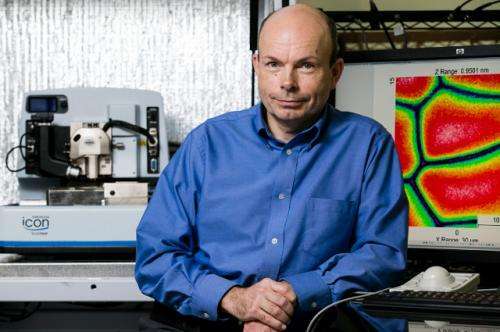 By 1994, as a member of the microbiology department at the University of Toronto, he was among the first to use AFM to study bacteria. Zooming in on a probiotic bacterium used to make Swiss cheese, Sokolov revealed a never-before-documented process by which the cell repairs its surface after sustaining chemical damage. The experiment also demonstrated AFM's ability to detect mechanical changes in living cells at unprecedented resolution—something that would be useful in Sokolov's later work. "That was the beginning of my love of biomedical applications," says Sokolov, who also has appointments in the departments of biomedical engineering and physics. More recently, Sokolov and his colleagues have used atomic force microscopy on some of the most mysterious cells of all—malignant ones. 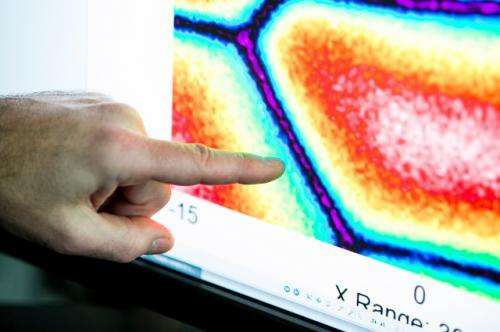 Most existing diagnostic tools use the cells' chemical footprint to identify cancer. In a series of experiments over the last five years, he looked for physical differences between cancer cells and healthy cells that could help physicians diagnose cancer earlier and more accurately. Early detection substantially increases patients' chances of survival. He and his collaborators have had some promising results in preliminary studies using cervical and bladder cancer cells—"cancers where you can harvest cells without biopsies—very un-invasive methods," he points out. In 2009, Sokolov and his colleagues at Clarkson University in New York studied healthy and diseased cells that were virtually identical, biochemically speaking. Searching for some physical or mechanical difference that could help distinguish the two types of cells, the researchers found that the surface coat surrounding cancer cells—what Sokolov calls the pericellular brush layer—was markedly different from that of the normal ones. "That was definitely new," he says, noting that similar results were recently published by researchers using more traditional biochemical methods. "The authors called those findings the result of the change of paradigm of looking at cancer." The pericellular brush layer is something like a cell's fur coat, and it can resemble that of a Persian cat or that of a mangy mutt. It's in the density and size of this brush layer that the researchers found significant differences between cancer cells and healthy cells. In a 2009 paper published in Nature Nanotechnology, the team reported observing a relatively uniform brush layer in healthy cells, while in cancerous cells, they saw a two-tiered brush layer, with sparse long hairs and dense short bristles. When the scientists dusted cell cultures with fluorescent particles, they could see—even with the naked eye—that the particles had stuck to the cancerous cells, leaving glowing evidence of the disease. "You don't need any device to see the difference. It created a very strong visible gradient for cancer cells," Sokolov says. That fact turned out to be more interesting than useful as a diagnostic tool, though. That's because the suspect cells have to be cultured in a dish—and scientists can already identify cancerous cells simply by watching them grow. So Sokolov's team searched for other parameters that might alert pathologists to the presence of cancer. After testing many cellular characteristics, the researchers found one key variation, a trait called "fractal dimensionality." Fractals are defined as "self-similar" patterns that look about the same at various scales. They occur often in nature. Think of a tree: the thinnest leaf-bearing twigs repeat the patterns of the broader branches below. They look about the same as you zoom in or out; you lose your sense of scale without another object to tip you off. "Fractals typically occur in nature from chaotic behavior. Cancer has been associated with chaos as well. Therefore, many researchers predicted connection between cancer and fractals," Sokolov explains. And when his team used AFM to look at the surface of cells, the researchers saw virtually a 100 percent difference in the fractal dimensionality of normal and cancer cells, a finding they reported in the journal Physical Review Letters in 2011. More recently, Sokolov and his colleagues were able to determine that this fractal geometry occurs during a specific, intermediary phase of cancer progression. The results—recently submitted for publication—might one day help doctors not just diagnose the disease but also monitor its progression. "So far what we have seen is pretty precise, way more precise that anything that is available to doctors to diagnose cervical cancer today," says Sokolov. He notes that the common Pap smear test is prone to turning up false positives and missing early cancers. Though the test has brought mortality rates down since its introduction, it has never been the subject of a randomized controlled trial—the gold standard of scientific research—and there are no universally accepted definitions of the test results, according to the National Cancer Institute. "It still has insufficient accuracy, leading to costly and unpleasant unnecessary biopsies," says Sokolov. The cancer research is just one of several projects Sokolov and his two postdoctoral fellows together with four graduate students—two mechanical engineers and two biomedical engineers—have underway in their labs at 200 Boston Avenue. The group, with collaborators from Tufts Medical Center, Dartmouth College and institutions all over Boston, is also looking for other nanotech approaches to diagnosing cancer. They've already developed a high-resolution, high-speed test that could eventually lead to a new way to study changes in cells when they become malignant. Thinking more long-range, Sokolov floats the idea of a nanoparticle patrolling the body that can change color when it detects something bad. "Like a time bomb, some of these cells will turn cancerous," he says. "At early stages, cancer is pretty easily killed, so early diagnosis may help eradicate it."